A couple of months ago I worked on a film called The Plotters by the Guerrier Brothers for the Virgin Media Shorts Competition. And let me tell you, my running was exceptional. Well, I’ve just heard the fantastic news that the film has been shortlisted, and will be shown in cinemas around the UK for the next year. Which is particularly good, because a) the film is brilliant and b) Tom and Simon are both top blokes who deserve wider exposure. Never fear, my made-up friend! If you can’t wait until then, you can watch The Plotters online. If you particularly like it, you can even vote for it on the Virgin Media Shorts facebook page or by tweeting “The Plotters #VMShortsVote” on your Twitter account, which will help determine the runner-up prize. Not that they’re not going to win the grand prize anyway, but, well, it couldn’t hurt now, could it? Other shortlisted films are available. 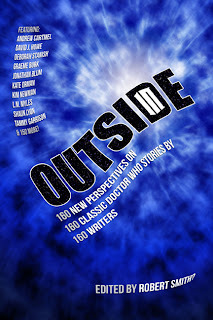 I’ve got a piece published in Outside In, a new book edited by Robert Smith?. This is actually going to be the first time something I’ve written’s been in a book, so I’m rather chuffed about this. Pre-orders should be available from the end of September. More details to follow! Brent Reid on Nancy, BTW, is not a prostitute. tejaswa on Coupling: How it all ends. Adrian on Coupling: How it all ends.